Posted February 21, 2017, in News. In recognition of over 20 years of service to the citizens of the City of Millville and Cumberland County, the Walter Rand Institute for Public Affairs is honoring Cumberland County Freeholder Director Joseph Derella as its Public Sector South Jerseyan of the Year on Thursday, May 4th at the 16th Annual Walter and Leah Rand Awards Scholarship Dinner. 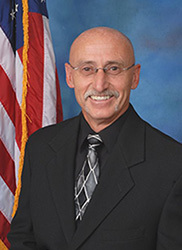 Joseph Derella has served as an elected official, both as Vice Mayor of the City of Millville for 15 years and County Freeholder and Freeholder Director for the last five. He is the Freeholder Liaison for the Departments of Administration and Public Safety and previously volunteered as Millville’s Board of Education President, a member of the Millville Planning and Millville/Vineland UEZ boards, and as a Cumberland County Improvement Authority board member. Freeholder Director Derella and graduated from West Chester University in 1978 with a bachelor’s degree in Health and Physical Education. In addition to his elected roles, he is a member of the Elks Lodge #580, Shekinah #58, Kiwanis, the Millville Thunderbolt Club and Hall of Fame Committee and currently serves as President of the Southern New Jersey Freeholder’s Association. He is passionately proactive in keeping the area’s youth safe and recently convened a panel of experts comprised of law enforcement, education, not-profit, faith service, human services and government officials to create new and innovative alternatives for addressing crime in Cumberland County. Director Derellas’ involvement with the Cumberland County Positive Youth Development Coalition (CCPYDC) has enabled him to be part of ground-breaking initiatives that create meaningful impact in the lives of area youth. Through programs like ‘Coffee with a Cop’ that originated in the City of Vineland, to Station House Adjustments and local Chaplaincy programs, youth offenders are getting a second chance through community-crafted support mechanisms. Freeholder Director Derella and his wife Susan reside in Millville with their daughter Casey, son Jake and family dog Daisy and spends his free time with family and friends enjoying all Cumberland County has to offer. Page last updated by Senator Walter Rand Institute for Public Affairs at 3:07 pm February 28, 2017 . This page was printed from http://rand.camden.rutgers.edu/2017/02/21/derella-public-sector/ at 4:59 PM Monday, April 22, 2019.